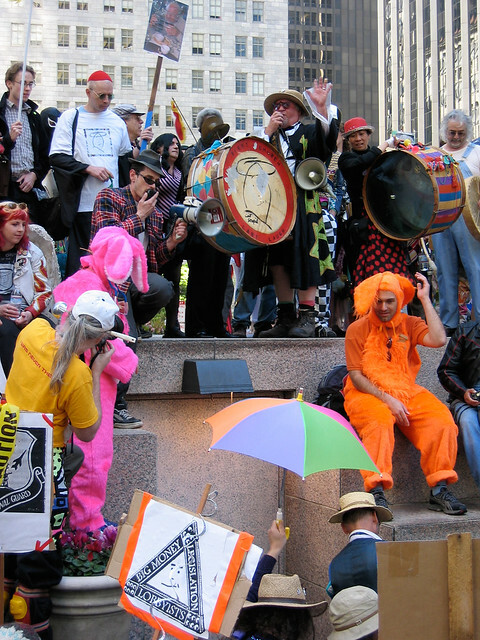 The 28rd Annual St. Stupid’s Day Parade takes place this Saturday, April 1st in downtown San Francisco. Meet Bishop Joey by the pointy building at noon and dress for stupidity. It’s that time of year again, time for the FIRST CHURCH of the LAST LAUGH’S one and only hole-y day, the ST. STUPID’S DAY PARADE. This year’s 28th annual parade follows the weekend route, starting at the POINTY BUILDING (transamerica pyramid) at NOON and heading up COLUMBUS AVE to WASHINGTON SQ PARK for a staged event with heretical music, discount dogma, a faith based 2 minute talent show and the traditional FREE LUNCH! The public is encouraged to join this unique San Fransisco tradition with their own music, noise makers, costumes and silly business to honor St Stupid, patron saint of civilizations and parking meters. To get a better idea what all of this stupidity is all about, here are my photos from the 2004 St. Stupid’s Day Parade (unfortunately I missed last year’s parade). UPDATE 1: After the parade, come on out to the St. Stupidâ€™s Day Parade, After, After Party. UPDATE 2: Here are the alternate plans if it rains on our parade. UPDATE 3: Here are my photos from the St. Stupid’s Day Parade.